A Solution to Help Users Answering their Business Questions in a Glance. 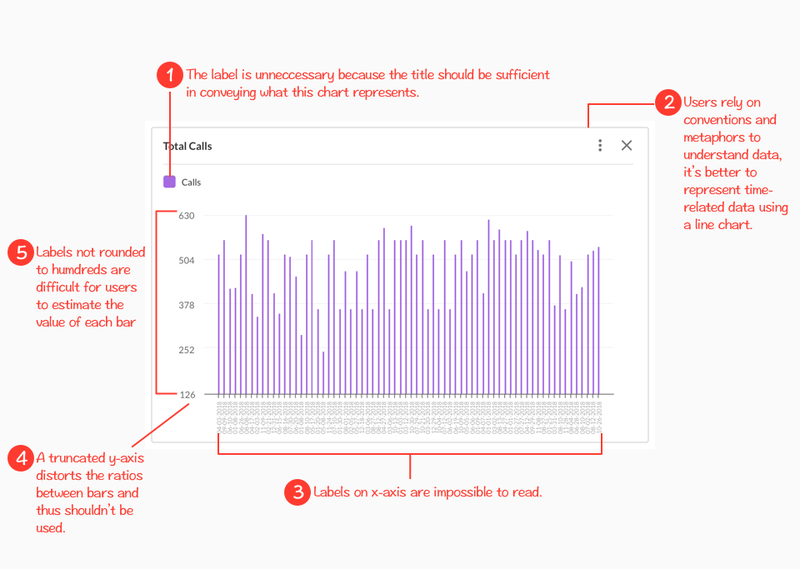 As the lead designer in Analytics team, I was tasked to decide what data needed to be displayed on different role-specific dashboards, how to visualize them and lay them out in a way that fits users' workflow best. Nextiva currently offers VOIP Analytics Dashboard for all of their VOIP customers. 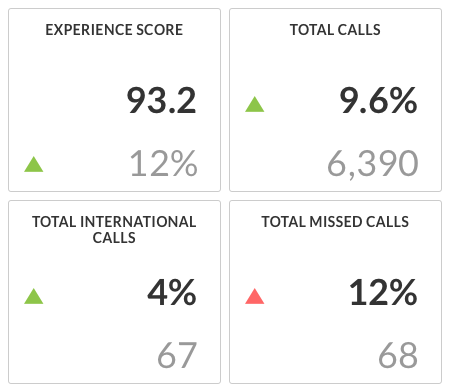 This dashboard contains a few data points that answer popular calls-related business questions customers have. In the upcoming version of Nextiva Analytics, they planned to offer more data from other products such as CRM, Chat, Email & Survey etc. As a result, a one-size-fits-all dashboard would no longer be useful for the growing types of users. 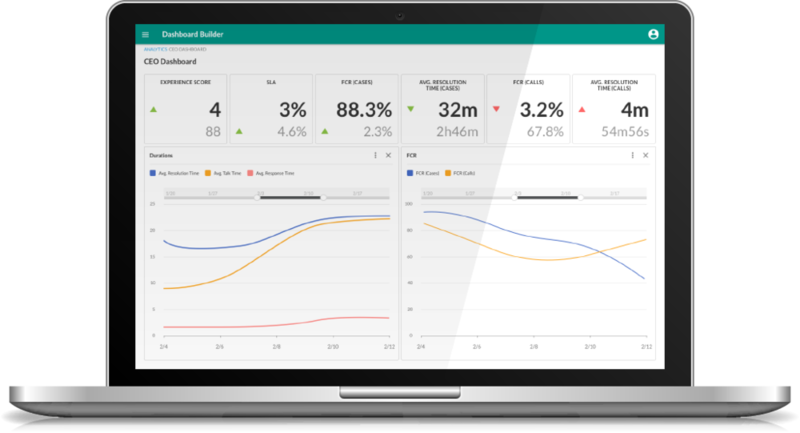 The product team thus planned to offer various role-specific dashboards that users can choose to display on Analytics' landing page. The final deliverables were two dashboards below with components that can answer business questions for different users. They were later built using a dashboard builder I designed. As of June 2018, one month after the dashboards launched. We received partners' feedback saying they found the new dashboard fit their needs much better than the previous one. As a next step, I was planning on checking the adoption rate on Google Analytic and from there I would decide whether we need to make changes. STEP 1 - Who are the Users? 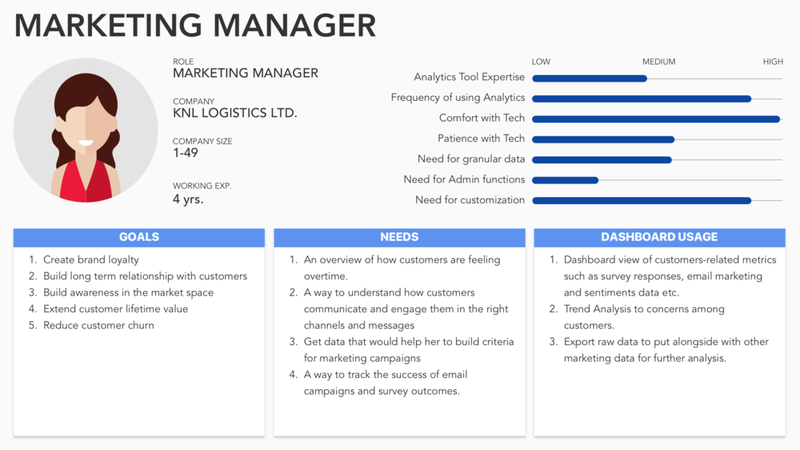 From user research I previously did, we identified 3 major types of Analytics Users - CEO, Support Manager & Marketing Manager. STEP 2 - What are their Business Questions? 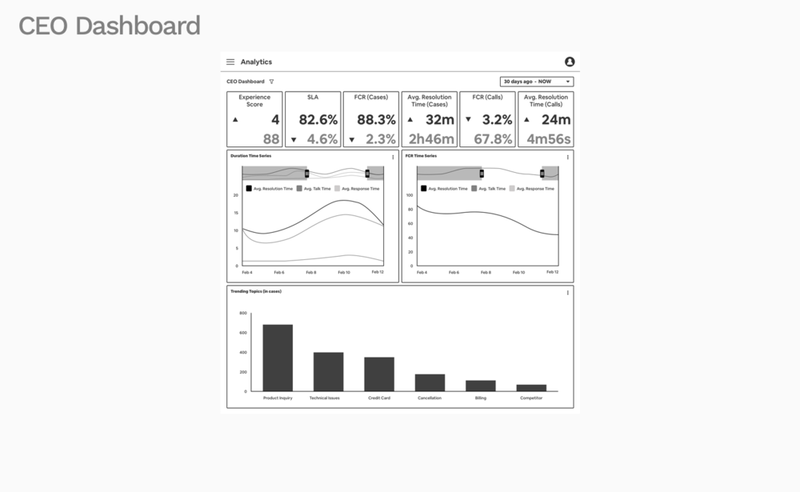 A dashboard is a visual display that answers business questions at a glance (source). 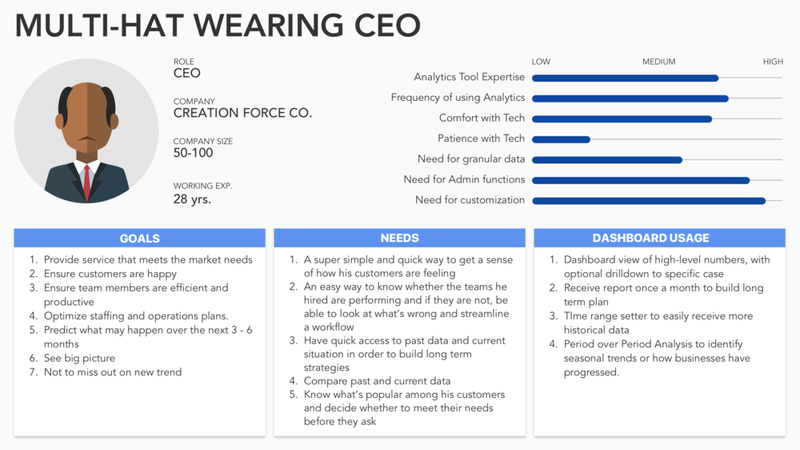 In order to find out what to include on each dashboard, I decided that my first step would be to figure out what business questions they are asking. Based on each of their goals and needs, I summarized their key characteristics and listed out their business questions (as below). The questions below were kept at a high level and most core to users' main goals because this task focuses on a landing dashboard that is meant to answer their most important questions. And as needed, they could drill down to a more detailed level. I then took these questions to be validated by our Business Analysts, Support, Marketing and Operations Managers. Overarching objective : Maintain customers' satisfaction while making profit. Key Characteristics : Predicts what may happen and creates long-term strategies. Are my latest strategies effective? What are some trending topics among my customers? Overarching objective : Avoid customers' dissatisfactions and maintain support agents' productivity. 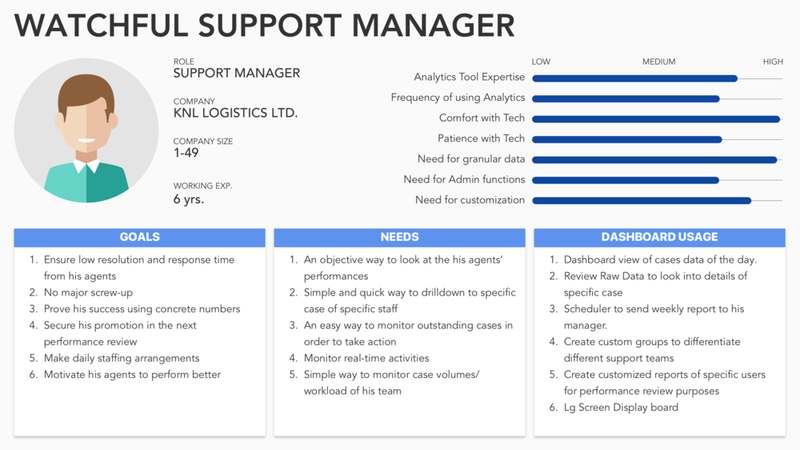 Key Characteristics : Creates short-term operation plans for support team. What is today's cases' volume? Are my agents meeting expectations? Do we have enough support agents? Overarching objective : Builds long-term relationship with customers. Key Characteristics : Figures out the right time and channel to communicate with customers. How are my customer feeling? In what ways are my customers communicating? Did my marketing campaigns drive improvements in sales? What are some things my customers care about these days? STEP 3 - What Data do we have to Answer those Questions? Next, I gathered a list of available metrics from product teams so that I could match them with the business questions. If I had the budget and time, I would have created a survey and asked users to order the metrics by importance, then followed up with interviews to understand why they ordered the way they did. But since we didn’t, I decided to use my past experience as an Analyst to match the metrics to the business questions and invited internal teams with related experience to comment and validate my assumptions. After matching the metrics with the business questions, I learned that Channel Metrics or Email Marketer Metics that would be essential for the marketing personas were not ready. So we had to put the Marketing Manager Dashboard on hold until more metrics became available. List of available metrics I gathered from other product teams. STEP 4 - KPI Tiles or Charts? KPI Tile displays the summary of a single measure. It is most effective when used to measure progress and the distance to a goal. to put KPI tiles that are meant for measuring progress against goals on top (viewers naturally view thing starting at the top). to keep the information on this dashboard in a higher level so that they can dig deeper when needed. Then, I sketched out ideas on paper and shared them with our internal teams for feedback. On the left is an example of sketches that I shared with them. 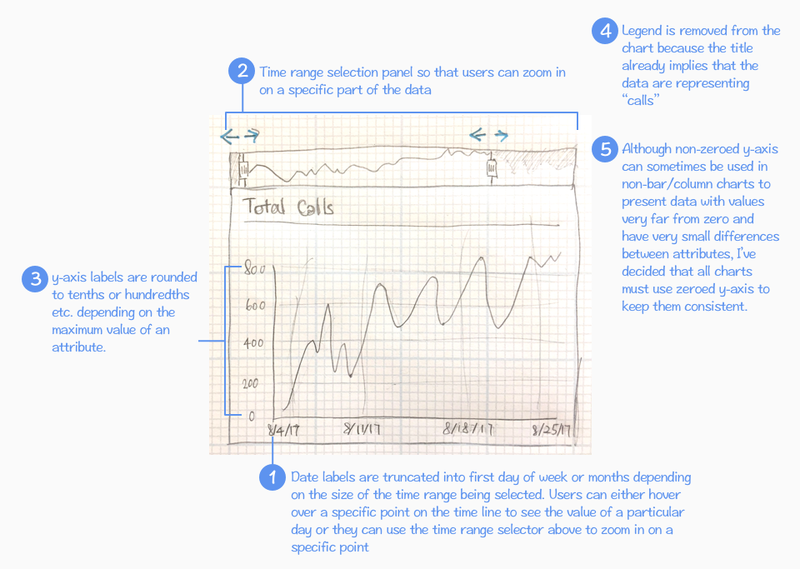 During the iteration process with my coworkers, I also recommended many ways to visualize data that would help them to analyze better. For example, for CEO to quickly understand the productivity of the team, one of the ways is to correlate avg. talk time with FCR (First Contact Resolution : Is a case being resolved upon the first exchange? ), so I designed this chart with dual axis on the right. However, after speaking to development team, I was told that we didn't have the capacity to implement dual axis on a chart yet. So instead, I put the two charts side by side on a dashboard. 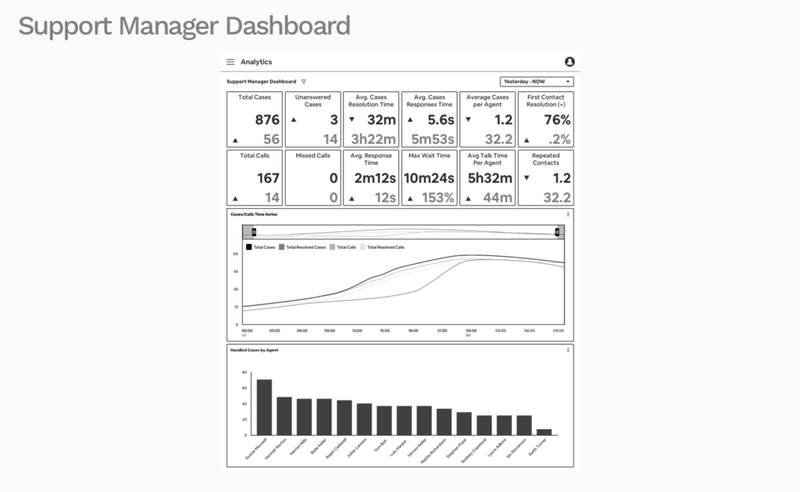 After several rounds of iterations, the end results were these two dashboards for CEO and Support Manager respectively.